Norwich church Proclaimers have announced that they plan to write and release a song that celebrates Christmas in an audacious bid to get to the top slot in the UK charts this December, reports Network Norwich and Norfolk. Proclaimers are organising an ambitious campaign to write, record and release a Christmas single that will reach the number one slot. And they are looking to involve the people of Norwich to help them reach this goal. 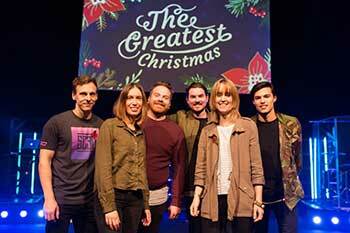 Associate Pastor Dr Phil Temple, the Project Coordinator, said: “Can you remember the last time there was a Christmas number one that was actually about Christmas?. It was 2004 with Band Aid 20’s Do they know it’s Christmas?. That was 12 years ago. And the last Christmas song before that was in 1990 with Cliff Richard's Saviour’s Day. The group are aiming to write a feel-good Christmas song with input from people in Norwich with every element of it, from contributing suggestions for the melody, writing lyrics, video and graphics production, to performing in the song itself. They are going to be working with local high schools and choirs on the project but are open to suggestions from people across the city. They will be canvassing for lyrics in the city centre and are will be holding auditions for those wanting to sing on the final release as well. Once the song is released next month, profits from sales will be donated to local Norwich charities. Phil said: “We are hoping that if we can get the people of Norwich, Norfolk and then beyond to get on board via social media, we can create enough groundswell of interest and support that it will get the attention of the wider media, which may well just snowball to us being able to get Norwich the Christmas number one slot in the UK charts this year. If people are interested in supporting this campaign the group are using the hashtag #TheGreatest and can be found on Facebook, at @proclaimersnorwich on Twitter and Instagram. To be a part of the project, or to find out more, email christmassong@proclaimers.com.